Do I need KFS training? Welcome to the Kuali Financial System! 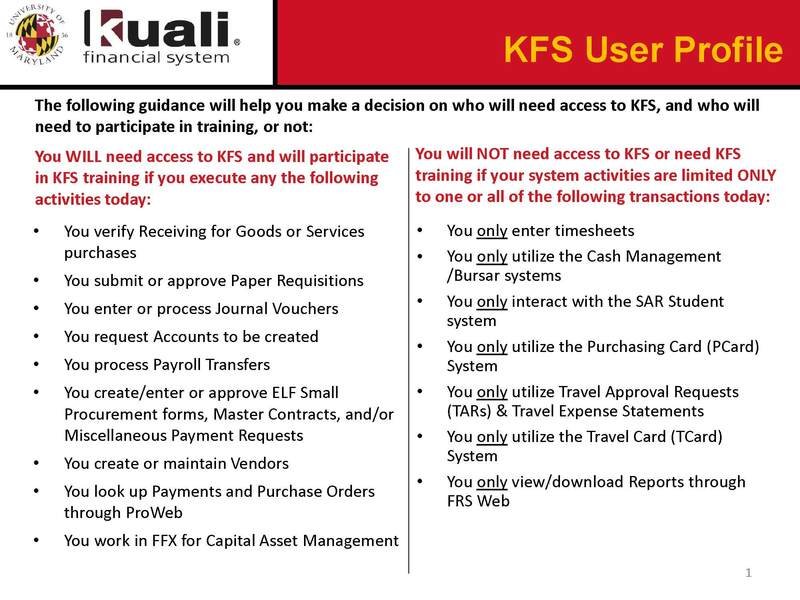 The Kuali Financial System (KFS) is used to process accounting transactions, purchasing and accounts payable, asset management, labor distribution as well as other financial functions. The data from KFS is exported to JasperSoft for the creation of University reports such as account transactions, month end, encumbrances, statement of payroll charges and a large selection of other financial reports by division, department, sub-department and account that are accessed through KFS Web. KFS is accessible by the staff for the University of Maryland, College Park (UMCP), University of Maryland, Eastern Shore (UMES), University of Maryland Center for Environmental Science (UMCES), and University of Maryland System Office (USMO). March 2019 month end is finished and the reports are now available on KFS Web. Training registration is now available. Please go to the Training menu and select the Training Registration for more details.